In 1919, the school's Company of Cadets had become Company K of the Memphis R.O.T.C. For the next six straight years it will win the annual competitive drill in the city. The government-sponsored Smith-Hughes program which had only been added to the school two years ago, has proved very popular and has caused "growing pains". A list of the 1920 graduates under this program in "Vocational Teaching" appears in one article below. On the list is a lady who will become prominent in the history of Tech, Effie E. Wright. There are others on this graduation who will become some of the original teachers of Tech - A.M. Boyd, A. L. Ferguson, S. F. Liles, E. H. Smith, H. H. Horton, J. B. Parker, and Ella Gill. Note: Even though Effie E. Wright had already taught at the Market Street School (Smith) in 1910, she enrolled in this Smith-Hughes "Vocational Teaching" program to get a special certificate (license) which enabled her to teach in any vocational school in the US. It was the same with others in this graduation group. The Memphis newspapers will continue to refer to the school as "Vocational High School", and sometimes, "Old Poplar Street School", or even "Memphis High School". 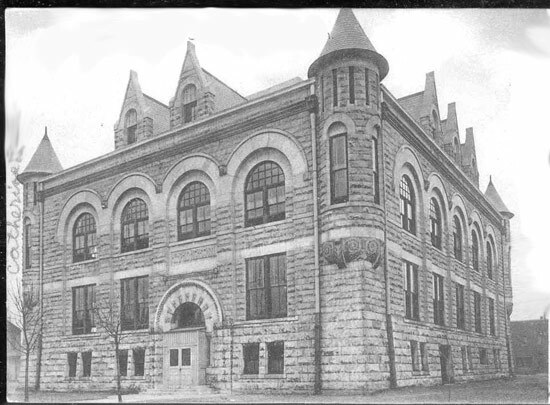 Perhaps this is because they were so conditioned to this building being the "Memphis High School building" since it was built specifically for Memphis High School and that school did occupy the building from 1898-1911. This is interesting because by the time the school moved to the new Tech High School building in 1927, the newspapers will have become so conditioned to calling this building "the Tech Building", they will continue to call it "the Tech Building" until it is demolished in 1964. We are sure the legend started that Tech is the oldest school, simply because it became so closely identified with the oldest high school building in Memphis. Below: A 1920 article about the mid-year Commencement. Below: A 1920 article about the March Commencement. In this class are two graduates who will become prominent in the history of Tech: Effie Wright and Ella Gill.